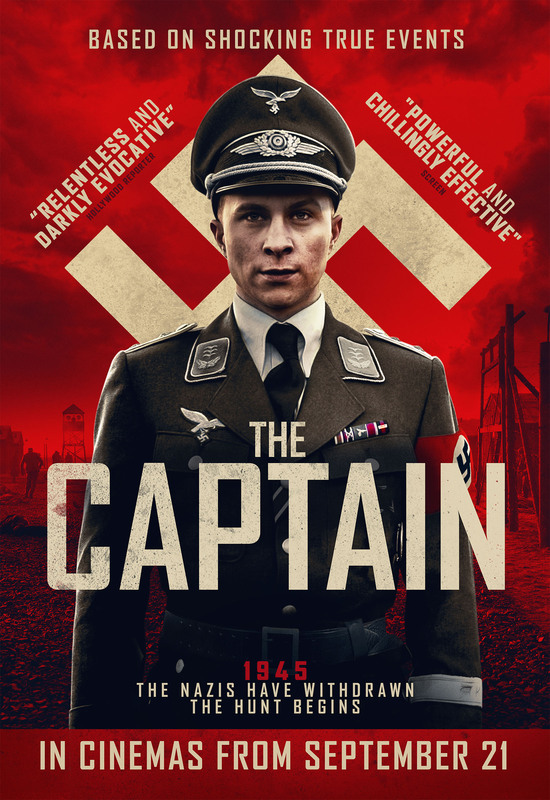 The Captain – Der Hauptmann is a German black and white movie, directed by Robert Schwentke (The Time Traveller’s Wife, Flight Plan, Red, Insurgent) and starring Max Hubacher, Milan Peschel and Frederick Lau. It premiered in the UK, last Friday. Before I even begin my review, I have to point out that this is based on a true story. Sometimes it doesn’t matter but in this case it does because if one thought this was fiction, one would find it over the top, but since it’s not, it’s really a shocking movie. The Captain begins with a hunt. A group of soldiers chases a young soldier, Pvt Willi Herold, who was separated from his unit. Obviously, they think he’s a deserter. The scene is more than effective. We can feel Willi’s fear. We can imagine what they would have done with him, if they had caught him, but they don’t. He escapes. It’s 1945, two weeks before the end of the war and things are chaotic. The Germans still hope to win the war but even the most hardened realize it might not happen. There are many soldiers, like Willi, separated from their units, but also a lot of deserters. When they get caught, they are shot immediately. Even though he’s escaped, Willi knows he’s still in danger. When he finds the uniform of an Nazi officer, he doesn’t hesitate and puts it on. As soon as he wears the uniform, roaming soldiers begin to follow him and accept him as their commander. At first, Willi is puzzled and a bit unsure but he soon realizes that the uniform has an almost magical power. The trouble begins only when they encounter fellow officers. They are a little less gullible and so, Willi invents a mission that, as he tells the people he meets, comes from Adolf Hitler directly. Willi and his band of soldiers arrive at a camp for political prisoners. At first, the commanding officers are not so sure about this Captain, but once they notice how determined he is, how willing to sort out their problems, they put him in charge. What follows is truly shocking. Not only is Willi cruel, but downright sadistic. He seems to enjoy executing and slaughtering people and abuses the blind obedience of his soldiers who follow his most cruel orders. No wonder, he was called The Executioner of Emsland. I have seen a lot of movies about depraved people, notably in war movies, but Willi Herold might be one of the worst. It’s shocking that someone kills and tortures without restraint, as soon as he gets the opportunity. And to think that all these people died at his hands only two weeks before the end of the war. I highly recommend this film. It’s a shocking story, impeccably told and masterfully shot. I’m still speechless. Thanks to Signature Entertainment for letting me view this film in exchange for an honest review. Copyright © 2010-2019 All About War Movies. All Rights Reserved. All content belongs to All About War Movies unless otherwise stated. It should not be reproduced without express written permission.